DiaDent is a leading manufacturer and exporter of dental materials, consumable supplies, dental instruments and small equipment. DiaDent has been a leader in the dental industry since 1985. Currently, we supply through a network of over 900 dental dealers in 117 countries. DiaDent is a worldwide innovative leader in the design and manufacturing of endodontic products especially Gutta Percha and Paper Points. Our commitment to quality was validated in the spring of 1998 when DiaDent’s Korean manufacturing facility was awarded both ISO 9001 and CE mark Certification. 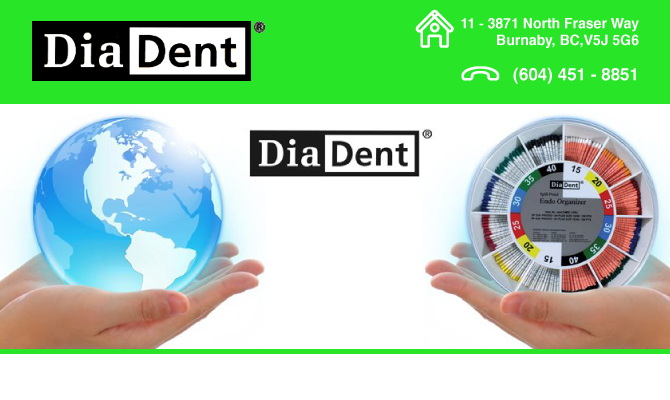 DiaDent continues to research and develop new products in order to better serve the dental professions. The commitment to continuous improvements and the creation of high quality products are the core of DiaDent’s success.